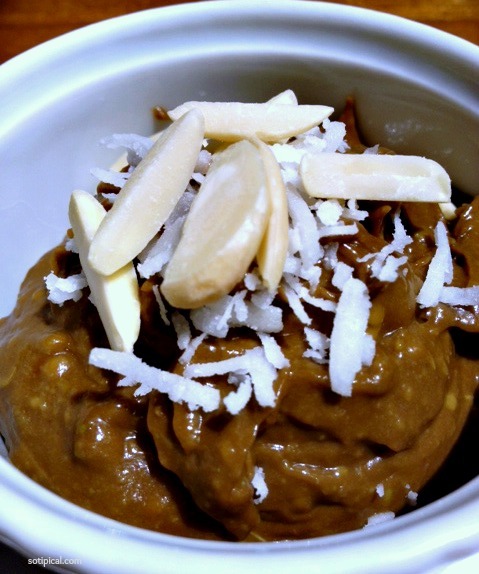 Paleo Almond Joy Pudding – GF, DF! I couldn’t shake my sweet craving this morning so I created this Paleo Almond Joy Pudding recipe. Chocolate pudding is one of my favorite childhood desserts. My grandma used to make an icebox pudding cake when we visited it was the BEST! This was before instant pudding was available. Another one of my favorites is a rich and creamy butterscotch pudding made from scratch. Let me just say that it has enough sugar to make you jitter, but it is absolutely delicious! Now of course this isn’t exactly like grandma’s pudding or my butterscotch pudding from scratch, but you can still enjoy a rich, chocolatey treat without all that sugar! Use a hand mixer to combine well. Top with coconut and almonds. This made enough for a single serving in a ramekin. If I were to make a larger amount, I would use a food processor or blender for a smoother pudding. Use refrigerated avocados, it helps the consistency. So if you were going to quadruple the recipe and use 2 large avocados, then I would not recommend using 12 teaspoons of cocoa powder. I think it would be bitter. Perhaps try 2 tablespoons worth. Start with less, you can always add more! *I used raw almond slivers, but the toasted sliced almonds would be even better. This pudding exceeded my expectations. It was rich, delicious and healthy too! I will make this again for sure!